To achieve this, it must advise governments and others on how to address the biggest energy challenge of the twenty-first century: preventing dangerous climate change. All 30 of the IEA’s member countries have signed the Paris Agreement, committing to keeping warming well below 2 degrees Celsius above pre-industrial levels, and pursuing efforts to keep it to 1.5 degrees Celsius. Emissions under the NPS would make the Paris goals unachievable, exhausting the carbon budget for the 1.5-degrees Celsius limit by 2022, and for a 2-degrees Celsius limit by 2034. Of the NPS’ recommended upstream oil and gas investment, between 78 and 96 percent – USD 11.2 to 13.8 trillion over 2018 to 2040 – is incompatible with the Paris goals. This excess investment should be urgently redirected into clean energy. Investment in fossil fuels beyond what is aligned with the Paris goals can lead to two possible outcomes. Either the sunk capital locks in emissions, causing the goals to be missed. Or the goals are achieved and the capital is wasted, potentially leading to economic upheaval. In calling for too much investment in fossil fuel supply, the IEA greatly increases the likelihood of one of these two outcomes occurring. Like a fallen lighthouse, the IEA has become a dangerous guide. Emissions under the IEA’s alternative “Sustainable Development Scenario” (SDS) would exhaust the 1.5-degree Celsius carbon budget by 2023 and the 2°C budget by 2040 2 degrees Celsius (Figure ES-2). The SDS has the same emissions profile as the IEA’s Copenhagen-era 450 Scenario (450S), which gives only a 50 percent chance of keeping warming below 2 degrees Celsius (Figure ES-3). Of the SDS’s recommended upstream oil and gas investment, between 70 and 94 percent would be surplus to the Paris goals (Figure ES-1). Investors testing their portfolios against the SDS or 450S would be undervaluing climate transition risk. The remaining carbon budgets associated with the Paris goals are now extremely small: at current rates of emissions, the 1.5°C budget will be exhausted in eight years, and the 2°C budget in nineteen years. By accepting a mere 50% probability of success, by assuming negative emissions technologies will be invented, and by assuming unrealistically low non-energy emissions, the SDS significantly understates the degree of change in energy systems needed to achieve the goals. Contrary to the principle of Common but Differentiated Responsibility, the IEA expects the majority of emissions reductions to occur in non-OECD countries (Figure ES-4). This is both unjust and understates the needed cuts in IEA full member countries. For example, the SDS has India cutting its 2040 emissions by 46 percent compared to the NPS, despite its pressing developmental needs, but the European Union by only 40 percent. 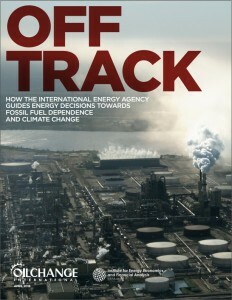 At least two of the authors of the IEA’s latest flagship publication World Energy Outlook (WEO) were staff on secondment from oil companies, which continued to pay their salaries while they were writing the WEO. Advocates of continued usage of fossil fuels in the 21st century seem to be interested only in the early demise of humanity on this planet. Good information. Hard to read font color/weight. The IEA led in creating scenarios of reducing fossil fuel usage by developing targets that had a chance of getting all countries on board. They developed a vision for a scenario to first create a dialogue in which unified action could take place, which is what finally happened in Paris. Then the disaster called Donald Trump happened. The IEA’s vision was that two transitions from the first agreement would be needed and so far we are still working on the first agreement. Their third scenario should already be in the negotiation stage but the countries of the world (OECD and non-OECD) have not negotiated in good faith. We still have the free rider effect strongly governing all action on climate change mitigation. Limiting warming to 2 degrees C was no longer a possibility as soon as Trump was elected. I am a US citizen. I am convinced that the real hope of sustainability lies in getting every Exxon/Shell/racist/misogynist/fat/lazy fossil fuel funded politician worldwide out of any kind of power position they have lied their way into.